Has summer found your neck of the woods yet? It certainly seems to have found Texas, that’s for sure. But we’re big and easy to find, right? Ha. Last time I was here, I talked about the book collection I was invited to join titled – Be Still My Heart. 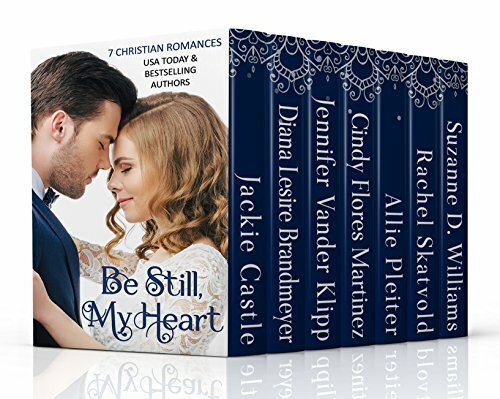 Seven authors got together with their seven Christian Romance stories and put them all together in a collection that’s going for only .99¢. What a deal, right? And right on time. Summer break is right around the corner. Here’s a bunch of clean, yet fun, stories to while away the long drives or flights, sitting in the sun or while trying to keep cool in the air conditioning. After you’ve met one of my new friends and co-contributors to this sweet collection, click over and have a look. See what all the fuss is about. But first, let’s take a moment to get to know Jennifer Vander Klipp. Jennifer, tell us a little about yourself and the kind of books you enjoy writing. I’m a mom to two young adults. In my other life, I’m a managing editor of a small publishing house. I love hiking, being outdoors, and fixing things up. I love writing romance because I think there’s something there that appeals to a woman’s heart. What inspired you to write that first book? I’ve always written stories, even as a little girl. My first published book, Coming Home, is a historical romance that takes place at the end of the Oregon Trail in 1881. The very first germ of that idea started as an AP history project in high school! I write alone for the most part. My cats are usually around somewhere. They think that the birds outside live behind my computer! Do you like to write to music or silence? Generally silence. I do sometimes like nature sounds like the waves or rain, especially to block out other noises. Sometimes, I put together movie soundtracks that give the feel of my book. I did this for my historical series using songs from famous Western movies like The Magnificent Seven and Bonanza. Writing about characters comes a lot more naturally to me than plotting. So while I do a lot to learn more about characters and make them come off the page, I’ve done far more work on understanding how the plot and structure of a book work to pull the reader through the pages. What are are your books about? I write contemporary romance, historical romance, and romantic suspense. No matter the genre, there is an ordinary woman who gets put in an extraordinary situation that she can only get through with God’s help. I never set out to write that, but that’s what comes out every time! Not overtly, but when you look back you see that all of the characters have to learn to trust God and His plans for them to move forward. I’m guessing since it’s a recurring theme in my books, I must be learning that lesson too! The end! Kidding! Seriously, like most writers, it is so satisfying to finish writing that book. It never quite comes out on the page the way you envisioned it in your head, and that’s okay. Every time I finish, I’m amazed that I have finished another book. It all seems like a bit of a magical process when it comes down to it. What is something memorable you have heard from your readers? That they couldn’t put my books down. That’s music to any writer’s ears. We hope we keep you up reading all night! Writing can be a lonely business. Follow your favorite authors on social media and get their newsletters and interact with them. Leave reviews about their books and share your favorites with your friends. Nothing means more to authors than knowing people are reading and loving their books. The Inn at Cherry Blossom Lane is in Be Still My Heart collection, and it takes place near Sleeping Bear Dunes National Lakeshore in Michigan. It was named one of the top beaches in the US, so the setting is fabulous. I loved doing the research for this book! Claire is helping her grandma turn her house into a B & B. And the contractor Grandma has hired is Claire’s schoolgirl crush, Alex. It’s a lot of fun to see them working together and rekindling their old flames. And there’s a bit of a mysterious twist when they discover an old diary and a secret room. You can get a short story about Claire’s crush, Alex, that takes place just before the book starts called “Never Met a Stranger” when you sign up for my newsletter on my website: www.JenniferVanderKlipp.com. Thanks for joining us, Jennifer. Now it’s your turn, dear reader, tell me what inspires you to first, pick up a book, then decide to read that book. I’ll pick one person to win a copy of Be Still My Heart. I’d have to say the cover is my first stop, too. If it captures me, I’ll stop and check out other aspects of the book. A good cover is so important! Thanks for sharing! I love getting to know new to me authors! Thanks, Paula! So glad I could share a bit of myself with you all! Hi Jackie and welcome Jennifer! No need to include me in the drawing, as I enjoyed reading the selections in the boxed set Be Still My Heart. Jennifer, as a Michigander I always enjoy reading stories with a Michigan setting. While I have never personally visited the Sleeping Bear Dunes, I have climbed the sand dunes since a teen at Warren Dunes State Park in SW Michigan. Delightful boxed set. Best wishes. The dunes all along Lake Michigan are such a wonderful feature! And they can be a workout too! Hi Jennifer, I love the chair you’re sitting in. I’m thinking of getting one like that for my office. I mean every writer should have a chair with words on it. And I have cats. One stays in my office with me and I call him my muse. Sounds like we’d get along great. The cover usually draws me first, then the back blurb can definitely inspire me to want to read the book. Or, if it’s by an author I already know and read, those books are automatically my want-to-read ones. I’m never opposed to discovering new authors though! Lastly, genre can draw me. Historical and suspense are my top favorite, though I read quite a mix. I loved that cover too! As soon as I saw it, I knew it had to be the cover for the book. Seems like a wonderful place to spend time! I love covers. But I usually zero in on a certain, favorite author. Then I’ll end up reading the back cover. I have read the novella by Jennifer and really enjoyed it! No need to enter me for the boxed set. I already have it! Thanks, Jennifer is an author to watch! Thanks for such kind words, Paula! That’s such an encouragement! First, the cover of the book. I know you shouldn’t judge a book by it’s cover but I do. Second, I turn the book over to read what it is about. Third, I always check to see who the publisher is. I volunteer in the church library and have for almost 40 years. This is the criteria I use when buying or accepting donations of books. Church libraries are such amazing resources. You must be such a blessing to so many readers! Hey, Jackie and Jennifer! First, I check the genre. Horror and sci-fi get ruled out automatically. I admit the cover plays a part. Sometimes a big part, sometimes a small part. If the book description sounds interesting, I look at the reviews. Excessive grammatical errors will turn me off. If the book isn’t classified as Christian, I search the reviews for references to heat levels and bad language. Of course, if it’s written by a favorite author, I can skip all of the above. Genre plays such a huge role, doesn’t it? It’s so nice to pick up a story and know what to expect. And favorite authors become a must read. I don’t need to be entered into the book giveaway since I already have the collection. Just wanted to say that I met you as an author through this novella collection and enjoyed your story. The cover first draws me in when I see a book written by an author I don’t know. But the blurb cinches the deal as to if I’ll read the book or not. Thanks so much! It’s always so much fun to gain new readers! I’m glad you enjoyed it!